Ceramics craftsman/artist Daniel Gelyukh lives in the town of Zikhron Yaakov, in Israel, where he has a small workshop at his home. His bright-colored hand made creations will raise your spirits and are the best possible souvenirs one can buy as mementos of one’s stay in Israel. 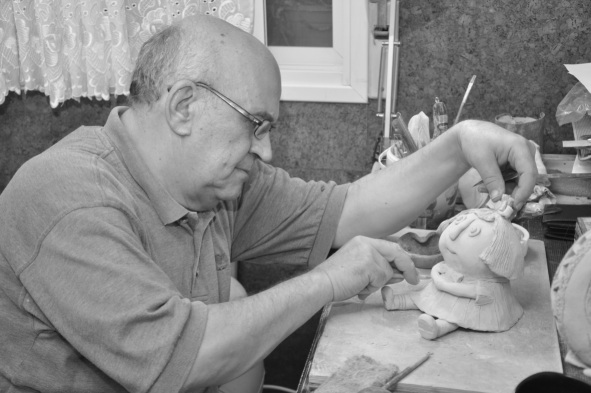 Many of his creations have already found their appreciative owners and can be found in the collections of ceramics lovers in Israel, the United States, Australia, Great Britain, Switzerland, Russia, Turkey and other countries. The broad assortment of this master craftsman/artist’s works includes figures of people, animals, birds, as well as teapots, ceramic tiles and interior accessories, which one can see in the Gallery section of this web site. Daniel Gelyukh became passionate about ceramics when he turned 30, and for the last 25 years the creation of ceramic art and artifacts has been his main occupation.